things of mutual interest including military history, current military affairs, and individual war stories. on Scottish and American military history for the general public. membership structure, and its purposes. Downey served as National Commander on the corporate organizational papers. introduced. William Wright (CL-2) served as the first elected National Commander. the Parade of Americans section of the parade supported by our guests The Black Watch Pipes and Drums of Canada. and 22 Posts in 16 states. Patriot continued its early relationship with the Scots-at-War Trust in the UK. in its influence in the Scottish-American community. In 2000, The Patriot was expanded to a 50 page quarterly magazine. active the establishment of NTD or have supported the U.S. military in various ways. United States with new posts being developed at a rate of four to five each year. In 2006, SAMS achieved a major milestone - 25 years old. At a highland game attended by our then National Commander and our Corporate Counsel, the Lord Lyon of Scotland had been the “Honored Guest”. 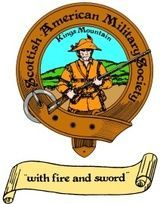 Our Commander and Counsel both being familiar with Scottish Arms met with the Lord Lyon, and reviewed with him SAMS’ history and its objectives. The Lord Lyon showed interest, and said a request for a “Grant of Arms” could be received from SAMS and reviewed for its appropriateness for making a grant of arms. The officers of SAMS were enthusiast about making such a request, and the request was made. 2006 also saw SAMS electing its first woman NVC. SAMS also developed a new official SAMS Dirk that could be used for National and Post awards. The Comptroller’s Report in The Patriot showed the Society’ financial position to be very strong - SAMS had really come a long way from its beginnings. In 2007, new Bylaws were proposed to, and approved by the membership. These Bylaw changes were a result of a perceived need for a more specific and formal set of Bylaws to support the continued expansion of SAMS and the growing responsibilities of its national management. 2008 was banner year for SAMS. The Lord Lyon granted SAMS “Letters of Patent”. These Letters of Patent approved SAMS as a “Society Noble of the Noblesse of Scotland” and granted SAMS with official “Scottish Arms”. SAMS continued to be a strong supporter of NTD through its member assigned as its formal NTD Liaison in Washington, D.C. On April 4th, President George W. Bush issued a Presidential Proclamation declaring April 6th as National Tartan Day. President Bush’s Proclamation followed earlier Senate and House Resolutions which SAMS also supported. Technical revisions proposed in 2007 to the Bylaws were accepted by the membership. The cover of a 2009 issue of The Patriot displayed in full color the SAMS Arms, Badge, and Battle Flag. As “Corporate” arms, SAMS’ Arms are authorized to be worn my members. The Quartermaster started to make approved copies of the Arms available to all Posts and members. The National Commander, Officers and the Councilors began working together (as required by the recently approved Bylaws changes) to implement those Bylaws changes and develop related long term policies. Additionally, a detailed Study by the Councilors was begun to evaluate how SAMS could be more effectively managed to meet the challenges of continued growth in the future. The Study started in 2009 to evaluate the changing needs of SAMS’ management ended with the conclusion that management’s needs have been constantly changing and will continue to change in the future. The Study also concluded that these changes, while appropriate and needing to be implemented by management to maintain operations, were often in conflict with policies contained within the Bylaws. These conflicts then required the Bylaws Committee to frequently draft and propose changes to eliminate these conflicts. The proposed changes then had to be submitted to the membership for approval. All in all, this became a to frequent, to costly, and to time consuming effort. To solve the problem, new Bylaw changes were proposed and approved, by the membership, removing management policies from the Bylaws. Additional changes also allowed the Council (as is authorized by North Carolina Law) to act in all matters for the Membership with the exception of Elections and changes to the Articles of Incorporation and Bylaws. The full Council under these changes reserved to itself the establishment of, and changes to “Regulations” that would govern the future management of the Society. In 2010, SAMS had another signature event with the acceptance of Honorary Membership by HRH Edward, Prince of Wessex. A special Certificate of Membership was presented to the Prince at the Greenville, SC Highland Games. The Patriot expanded its colorization to include the SAMS On Parade section. In 2011, the Council approved initial Regulations establishing how it would carry out its new responsibilities relating to directing the management of SAMS. The Council continues to develop and/or modify its Regulations while providing timely flexibility when and where needed. At the end of 2011, SAMS ended its 30th year of operations in a strong membership, management, and financial position to meet the future. In 2012, SAMS authorized the placement of advertisements in The Patriot to help offset the costs of publication. 2013 saw the increased use of Regional Meetings to facilitate Inter-Post communication and cooperation. The full Council now itself held the required National Annual Meeting as required by North Carolina law. Previous Annual Meetings of the Membership had proved to be poorly attended by the membership (quorum issues), expensive and impractical for a nationwide organization. 2014 saw SAMS fully entering the internet age of social media. Facebook was already in use by many Posts, and National began it own involvement. Online fund raising was used by SAMS to fund Grants approved by the full Council to organizations providing unmet services to veterans. SAMS continued to recognize those who had supported NTD by honoring U.S. House Member Mike McIntyre with an Honorary SAMS membership. Rep. McIntyre along with Rep. Duncan co-sponsored House Resolution 41 which recognized NTD. A summary of SAMS in 2015 finds SAMS with 43 Posts and 5 Camps spread across these United States. SAMS has 1,111 Regular Members, 573 Life Members, 74 Honorary Members, and our membership is consistent with IRS Regulations governing 501 (C) 19 Veterans Organizations. In total, 4500 members have passed through the ranks of SAMS. SAMS’ Assets and Equity remain at a healthy level sufficient to meet the needs of the Society. The Society is fully prepared to enter into its 35th year of operations in 2016 and beyond. Command Sergeant Major, and the services of Randy Downey and Al Ankrum by designating them National Commander's Emeritus.